73180-9249 - Chrome Parts Bag. 38 74790-4019 - Battery Retainer . 34 73180-2299 - Shifter Cover. 51 73180-2289 - Channel Cover (rear) . 52 73180-2279 - Channel Cover (front). 20 73180-2999 - Door Handle / Hinge Set. 7 73180-9389 - Footboard Assembly. 10 73180-2109 - Vehicle Body (n/a). 11 74790-2309 - Seat . 15 73180-9069 - Rollcage / Right. 16 73180-9049 - Roll Cage / Left. 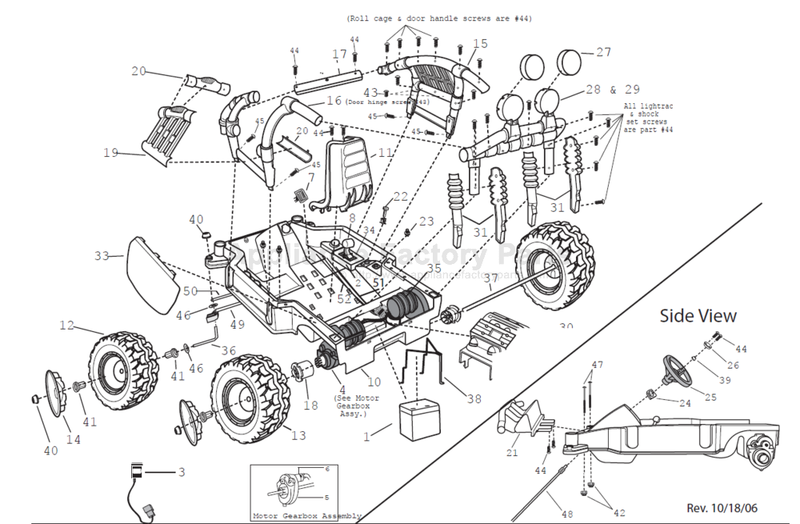 28 73180-9189 - Light Rack Front And Rear. 30 4000-0285 - Decorative Engine. 31 73180-951A - Shock Set (left And Right) . 33 73180-9029 - Fender Set . 36 74790-4509 - Front Axle . 48 74790-4239 - Steering Column. 73180-0320 - Mylar Black Decal Sheet. 43 0801-0202 - (1) # 8 X 1/2 Screw. 26 73180-2329 - Steering Wheel Button/cap . 24 73180-2339 - Steering Wheel Collar/stop . 25 73180-2319 - Steering Wheel.